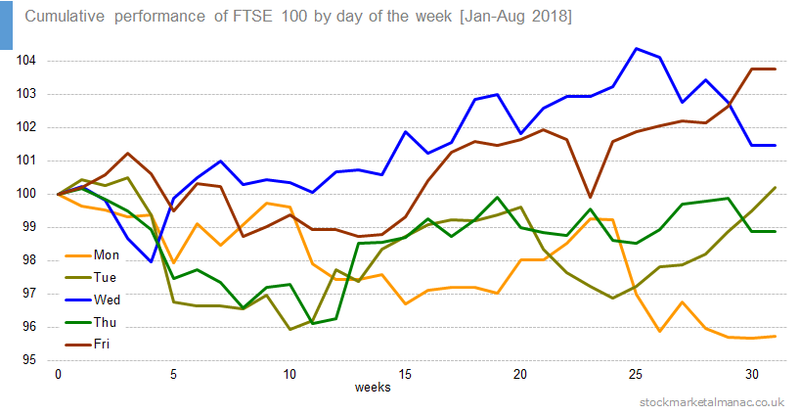 The following chart shows the cumulative performance of the FTSE 100 by day of the week for the period Jan-Aug 2018. From the beginning of the year the FTSE 100 Index has risen a cumulative 3.8% on Fridays, and fallen a cumulative 4.3% on Mondays. The chart below shows the frequency with which the index closes near to the high (or low) of the day. The data analysed is FTSE 100 Index daily data since 1985. The analysis first takes the day’s hi-lo range, and then calculates three threshold levels (1%, 5%, and 10%). For example, if a day’s low is 50 and high is 70, then the Hi-Lo range would be 20. And the 1%, 5%, and 10% thresholds would 0.2, 1 and 2. The day would be said to close within 10% low of the day if the closing price was below 52. 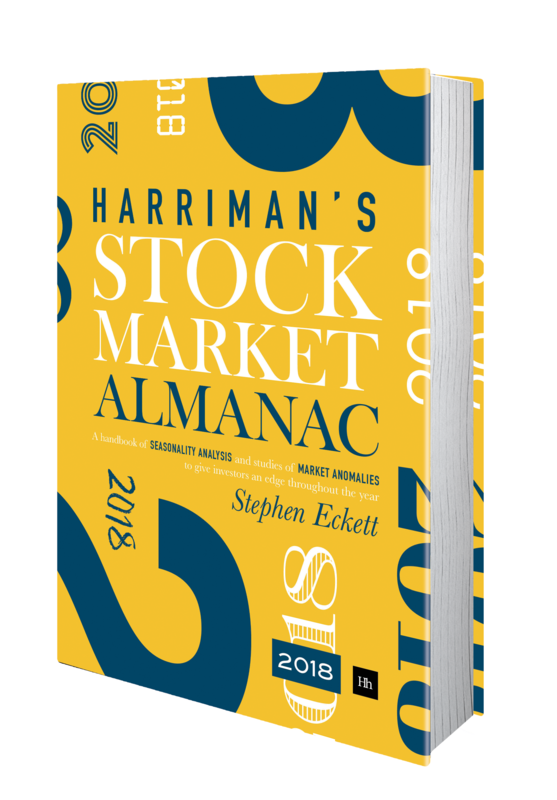 The day would be said to close within 5% of the high if the closing value was above 69. 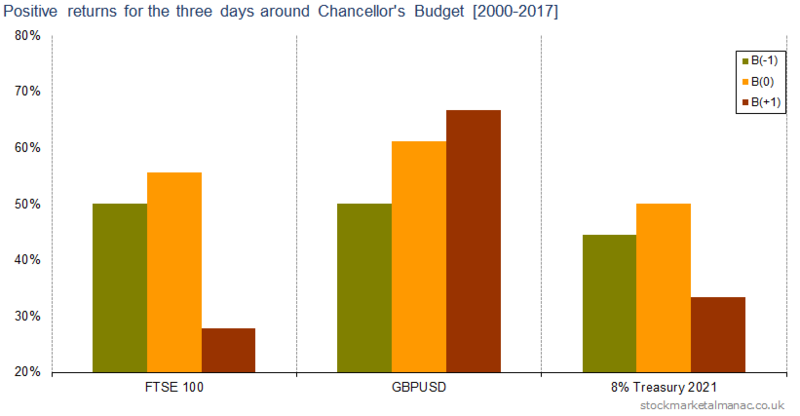 For example, since 1985 the FTSE 100 Index has closed within 10% of its daily high on 20.8% of all days, and it has closed within 1% of its low 5.6% of all days. An obvious observation to make is that the Index closes more often near its high of the day than the low. In nearly 1 in 10 days the index closes within 1% of the high of the day. 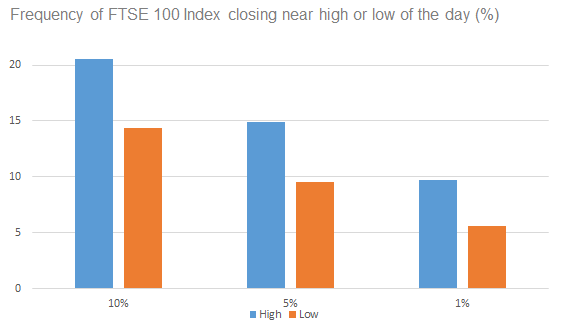 Continuing this analysis of where the index closes relative to the Hi-Lo range of the day, the following chart shows the performance of the FTSE 100 Index on the following day, split by where the index closed the previous day relative to that day’s Hi-Lo range. 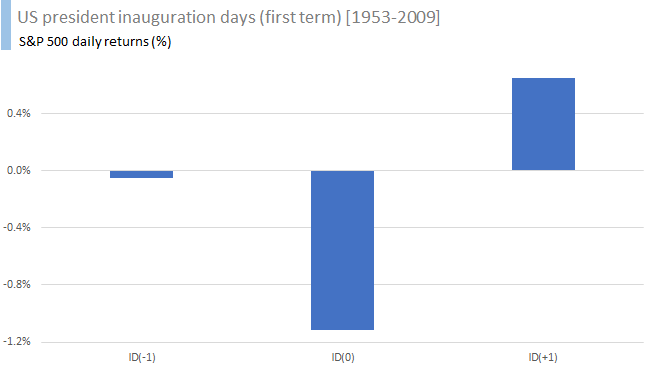 For example, on the days when the index closes within 10% of its low for the day on average the index return is -0.005% the following day; and when the index closes within 1% of its high for the day on average the index return is 0.16% the following day. As can be seen, the nearer the index closes to its high of the day, the higher the following day’s return. 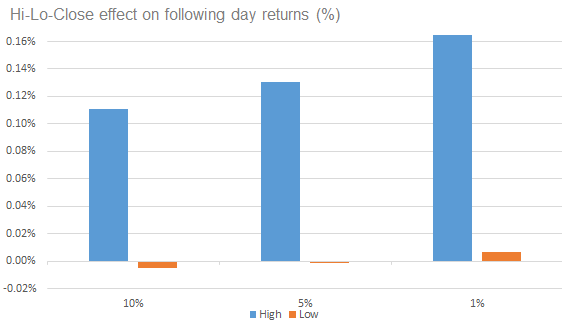 The other striking observation is that, whereas a close near the day’s high is associated with relatively strong returns the following day, a close near the day’s low has little effect on the average return the following day. An update of the Day of the Week grid. Other articles looking at returns on days of the week. Tax Day in the United States refers to the day by which individuals must submit income tax returns to the federal government. In the past Tax Day has moved around a bit, but since 1955 it has been fixed at 15 April. Although there are exceptions due to the close proximity of the Emancipation Day holiday in Washington State D.C. Such that since 2007 when 15 April falls on a Friday then Tax Day is moved to the following Monday, and when 15 April falls on a weekend Tax Day is moved to the following Tuesday. This year, 2017, 15 April is a Saturday and so Tax Day will be Tuesday, 18 April. It is probably not too controversial a claim that most people dislike filling in forms and paying taxes. Could this dislike affect individual investors attitude to risk around the time of Tax Day and. if so. could that in aggregate be sufficient to influence equity returns around this period? 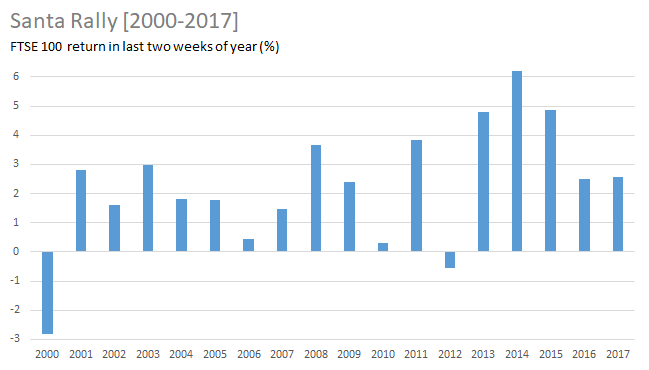 The following chart plots the proportion of weeks that saw positive returns in the S&P 500 Index for the two weeks before Tax Day and for the one week following Tax Day for all years since 1955. 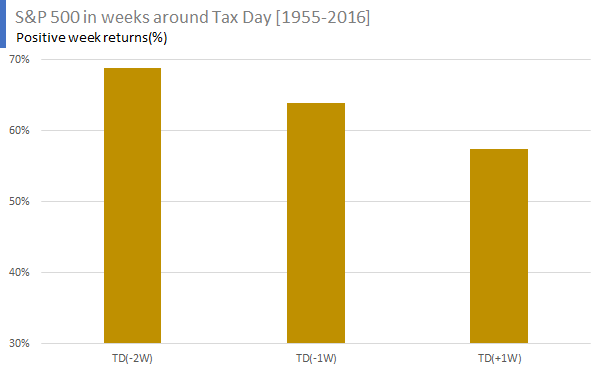 For example, the S&P 500 had positive returns in the week two weeks before Tax Day in 69% of years since 1955. As can be seen, over the three-week period there was a moderate decline in the proportion of positive weekly returns. The following chart looks at the same period and weekly frequency, but plots the average weekly returns. 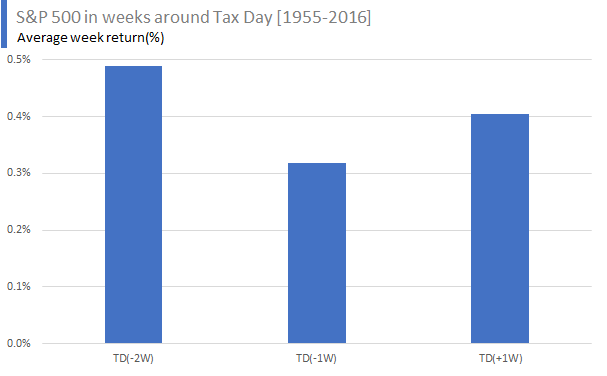 Here we can see relatively high returns two weeks before Tax Day, although this overlaps with the start of April which is usually a strong period for equities anyway. The week leading up to Tax Day is relatively weak, and then there’s something of a small relief(?) rally in the week following Tax Day. Let’s now focus in on the days around Tax Day. 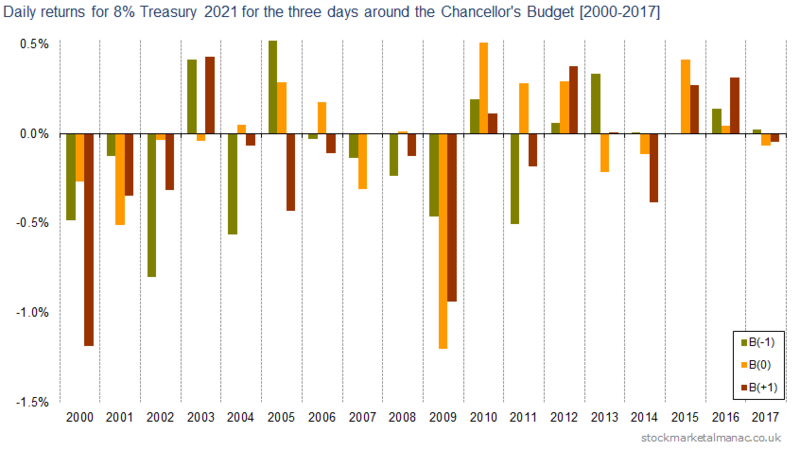 The following chart plots the proportion of days that saw positive returns in the five days around Tax Day. 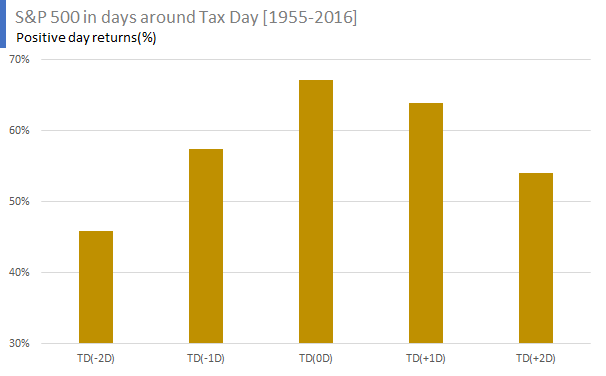 For example, since 1955 the S&P 500 Index has seen positive returns on Tax Day itself (TD(0D)) in 67% of years. 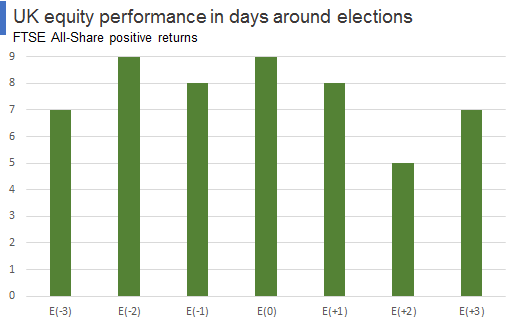 Historically we can see that returns have been depressed leading up to Tax Day, with the strongest returns in the 5-day period seen on Tax Day itself. The following chart looks at the same period and daily frequency, but plots the average daily returns. The same behaviour profile can be seen as in the previous chart. 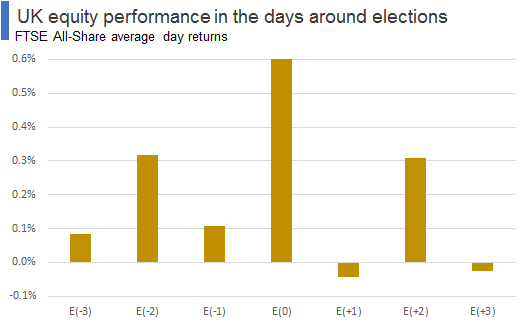 The weakest average daily returns in the period have been seen on the trading day two days before Tax Day. 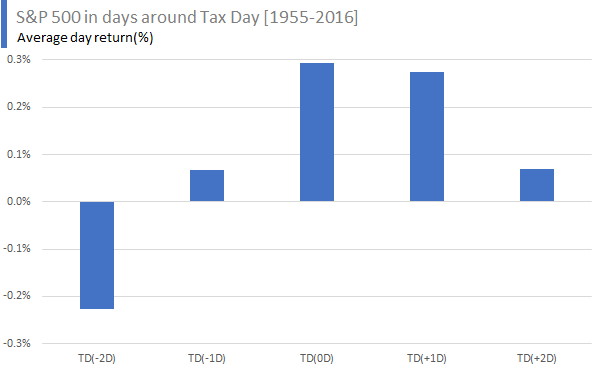 While the strongest average daily returns have been on Tax Day itself (with an average daily return ten times the average daily return for all days since 1955). 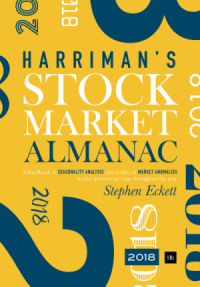 The results here are not strong, but there is some evidence that equities are relatively weak in the days immediately before Tax Day, but the market is strong on Tax Day itself. 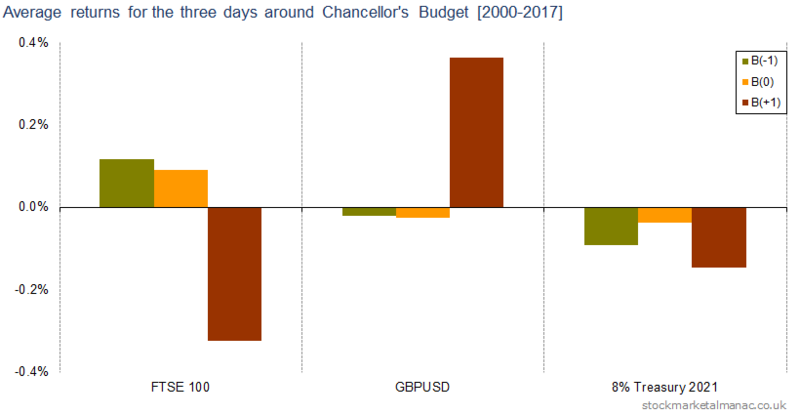 The following chart plots the daily returns of the FTSE 100 Index for the nine days around Christmas and New Year. 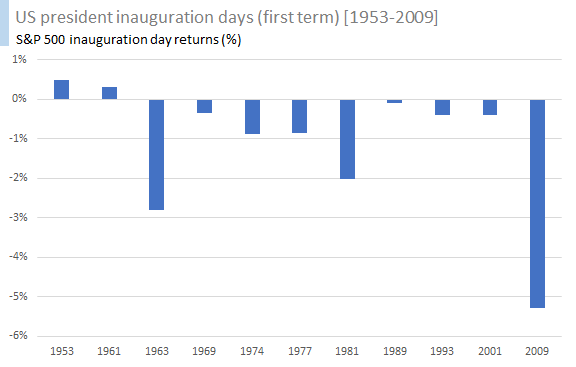 The blue bars plot the average daily returns of these days for the period 2000-2016. 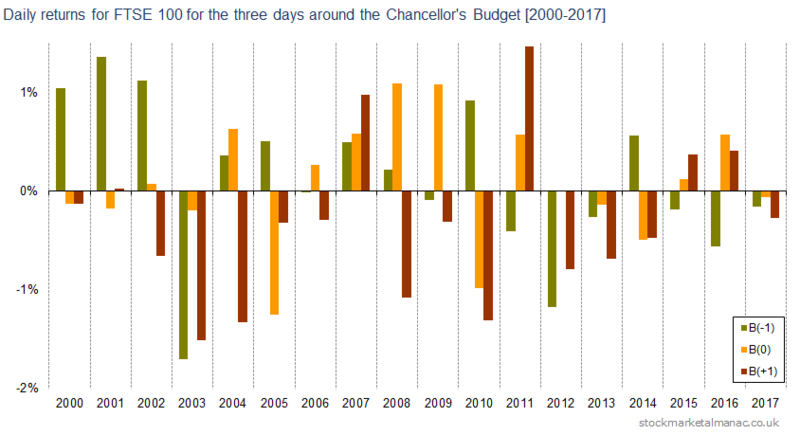 The orange bars plot the daily returns for the last nine days. 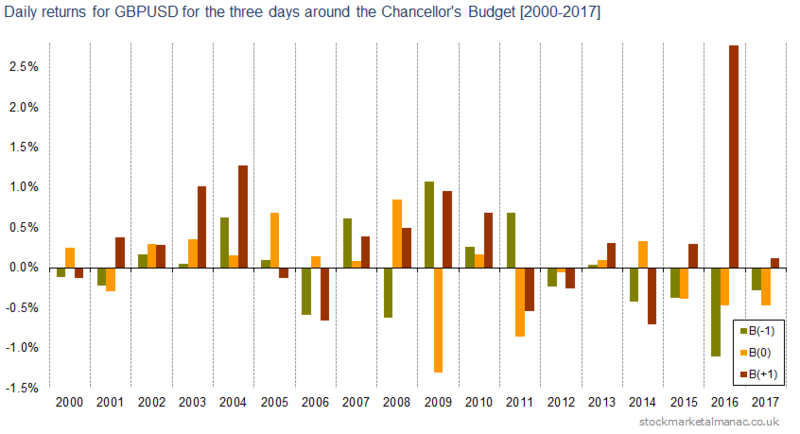 As can be seen the actual daily returns for the last nine days have been on the whole pretty close to the average daily returns seen for the last 16 years..
Strong returns have been seen on the trading days following Christmas and New Year. 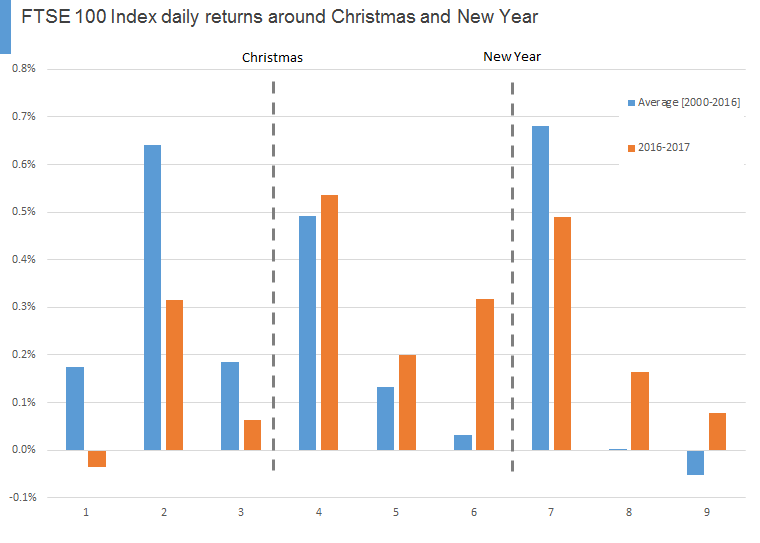 After the first day after New year, returns have trailed off (days 8 and 9 in the chart).